SPRINGFIELD – The Illinois Senate voted today to override Gov. Bruce Rauner’s veto of the legislature’s school funding reform measure. 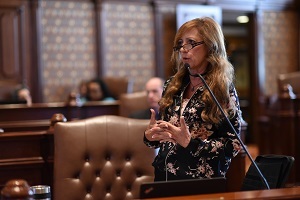 State Sen. Linda Holmes, D- Aurora, was one of the senators to cast a vote against the changes put forth by the governor. According to estimates from education funding reform advocates, schools in Holmes’ district would stand to gain millions of dollars under the Senate’s version of the proposed education funding law. Aurora East Unit School District 131 would gain over $13 million, Indian Prairie Community Unit School District 204 would gain over $800,000 and Oswego Community Unit School District 308 and Aurora West Unit School District 129 would both receive over $4.7 million in new funding. Another provision contained in Rauner’s veto would punish municipalities for using tax increment financing districts (TIFs), a tool commonly used by local governments to alleviate blight and create jobs. Rauner’s modifications would account for TIF revenue that is usually unavailable to school districts when dedicating funds, which would result in school districts in municipalities that use TIFs receiving less money from the state. “The governor reached well beyond the scope of this legislation to include this harmful, anti-business provision in his veto, which makes little sense after all of his talk about bringing good jobs to Illinois,” Holmes said.